In the mid-1970’s, Dr. Jimmy Milton founded the Southeastern Raptor Rehabilitation Center when the U.S. Fish and Wildlife Service brought six injured birds to the College of Veterinary Medicine and asked that the school become a rehabilitation hub for the Southeast. Dean Jimmy Greene, Dr. Greg Boring of Radiology and Dr. Milton arranged for Auburn University to become a regional center and accept injured birds of prey. Donations and volunteer work provided materials and labor to build a raptor barn behind the Small Animal Clinic in the late 1970’s. Birds were still treated in the hospital before being moved to small flight cages next to the barn. Later a hospital area was incorporated into the raptor barn. In 1998 the Elmore Bellingrath Bartlett Raptor Center Hospital was opened off of Shug Jordan Parkway behind the College of Veterinary Medicine. The facility was made possible by a $300,000 donation from Dr. Woody Bartlett ’64 in honor of his mother, Elmore Bellingrath Bartlett, a noted Alabama philanthropist. In 2002, the College of Veterinary Medicine opened the Carol Clark Laster/W.E. Clark Jr. Raptor Training Facility, which was made possible by Carol Laster of Birmingham. Laster, a retired junior high science teacher, donated $500,000 to the raptor center. Her husband, Dr. Russell Laster, is a 1951 graduate of the veterinary college. Mrs. Laster selected the Raptor Center for the gift after the death of her uncle W.E. Clark Jr., who left his estate to her care. The Raptor Training Facility consists of 24 state-of-the-art mews and an office building. Non-releasable raptors are kept and trained at the facility for use in the educational programs. The Laster’s also contributed to the rehabilitation unit with the construction of six large flight aviaries for aerobic conditioning of releasable raptors. In 2004, the Southeastern Raptor Rehabilitation Center (SERRC) was renamed the Southeastern Raptor Center (SRC) to reflect its multiple missions of rehabilitation, education and research. On November 16, 2005 the Edgar B. Carter Educational Amphitheater was opened through a formal ceremony honoring the late Edgar B. Carter, former director of research for Abbott Laboratories in Chicago. His daughter, Carol Clark of Princeville, Illinois, gave a $400,000 gift in his memory to fund the new facility. The amphitheater seats 350 visitors and provides a venue for onsite flight programs. In 2011, Dr. Bruce G. Pratt, a 1953 Auburn University College of Veterinary Medicine alumni, donated the much-needed paving of the entrance road into the Southeastern Raptor Center. The road was renamed Pratt-Carden Drive after the Pratt family and his daughter, Sarah “Tosh” Carden. The paved road allows for easy access for school buses and groups who come to attend raptor presentations onsite. In November 2012, a Welcome Center was officially opened to serve as a restroom facility for guests of the educational amphitheater. The Welcome Center was funded largely by donations from Stephen and Lori Malkoff of Enterprise, Alabama. Stephen Malkoff is an artist who has honored Auburn by drawing War Eagle VI, Toomer’s Oaks, and a Tiger in recent years. You can view and purchase these prints at www.tiger30.com. Also, in November 2012, a memorial garden was established and dedicated in honor of Paul Daniel Flournoy (1977-2010) of Fairhope, Alabama. Paul graduated from Auburn in 2002 with a degree in wildlife sciences. 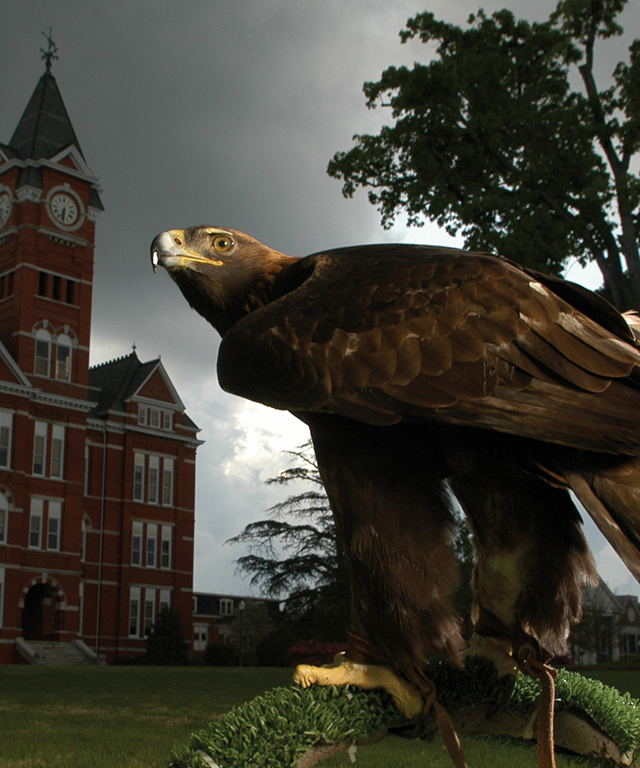 During his time at Auburn University, Paul volunteered at the raptor center and had a passion for birds of prey. The memorial garden and marker, given by the Flournoy family, is located outside of the Welcome Center and recognizes Paul’s work. Since its modest beginning in the mid-1970s, the Southeastern Raptor Center has treated and released thousands of birds of prey back into the wild. The educational unit has provided educational programs for thousands of schools, civic groups and churches in Alabama, Mississippi, Georgia, Florida, Tennessee and Kentucky.